I do get tired of the mashed pumpkin in just about every South African restaurant. 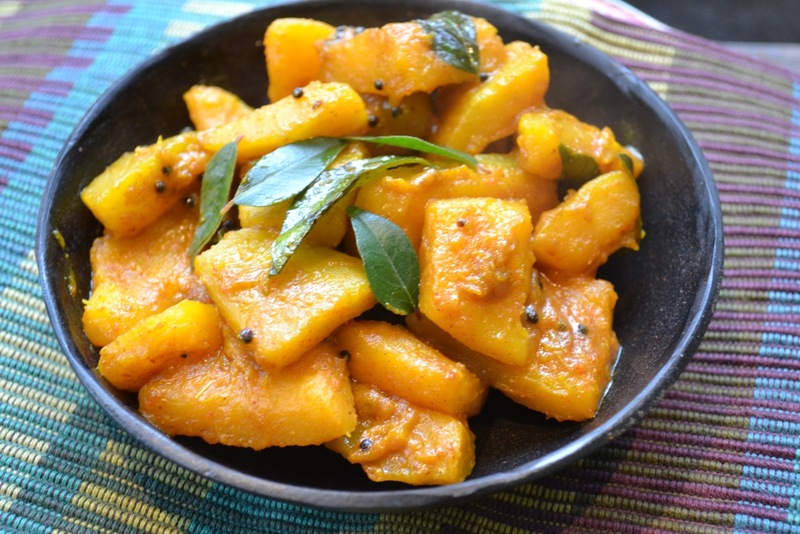 This is a deliciously spicy side dish that can be served even on a non curry night. The sweet spiciness works well with grilled meats and roasts. Serves 4 as a side dish – double up the recipe for a main!! Slice the pumpkin into pieces and steam until tender. When they begin to splutter, add the curry leaves and garlic. Saute for a few seconds and then add the steamed pumpkin. Add the boiling water, red chilli powder, roasted cumin and turmeric. Add the brown sugar and toss the pumpkin to ensure the spices are combined. Serve with hot rotis or puri. This can be served as a dip – cook the pumpkin with extra water until soft and mushy. Mash the pumpkin and serve with pita breads. Butternut can be used instead of pumpkin.